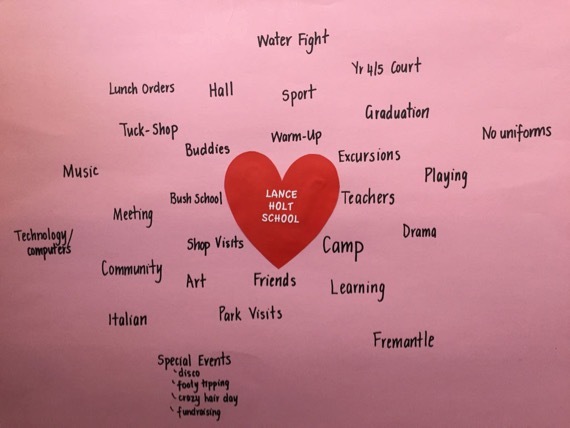 Lance Holt School in Fremantle has built up its own strengths, traditions and unique learning environment since 1970 with a long history of Values Education. From its early days the school has consistently focused on values such as social justice, sustainability and community participation. The school’s ‘whole child approach’ with an emphasis on student wellbeing and school connectedness is embedded in our whole school core values. We affirm the equal worth and basic right of all persons. In doing so we recognise individual differences and the uniqueness of the individual. Pictured: Children identified what they most valued about Lance Holt School. The closer to the heart the more highly valued by the children.